Home > Will There Be Any Shocks in the Latter Stages of the Champions League? With Barcelona and Bayern – probably the two stand-out sides in European football at the moment – safely in the hat for the semi final draw, you could argue that the best two sides left in the competition are still in the mix for glory. But upsets can happen in the knockout phase of the Champions League; as witnessed in last year’s tournament when Atletico Madrid disposed of both Barca and Chelsea on their way to the final. So can we expect any shocks in the latter stages of this year’s competition? Barcelona have made serene progress through the tournament so far, and were in mesmeric form when disposing of French champions PSG in the quarter finals. The 5-1 aggregate score doesn’t do justice to just how dominant the Catalan giants were. With the front three of Lionel Messi, Neymar and Luis Suárez contributing a combined tally of 64 goals in 82 appearances so far in all competitions, there’s clearly enough firepower there to blow away any opposition. And with the likes of Andrés Iniesta pulling the strings in midfield, anything is possible. But there’s a defensive solidarity to Barca now to match their attacking flair, and that’s not something you can normally associate with the four-time Champions League and European Cup winners. But it’s noticeable that Luis Enrique, in his first season in charge, has made them tougher to break down. They head into the semi finals in great heart then, and it would be a shock to see any side – Bayern withstanding – beat them over two legs. The fact that Bayern are managed by Barcelona legend Pep Guardiola could play into their hands. He is a two-tie Champions League winner as a manager, and was the man responsible for building the Barca side that has swept all before them in recent years. Guardiola is now building a similar legacy at the German club, who once again have dominated the Bundesliga to the extent that the title race was once again all but over by March. They were staring down the barrel of elimination from European competition, however, after being humbled by FC Porto in the first leg of their Champions League Quarter Finals clash. But a phenomenal performance at the Allianz Arena, where they led 5-0 at half-time, was enough to secure their place in the last four. 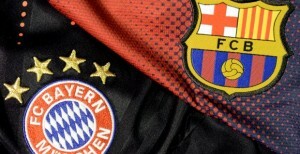 Like Barcelona, this Bayern side exhibits a fantastic balance of attacking flair and defensive solidity. Their three-pronged frontline of Arjen Robben, Thomas Muller and Robert Lewandowski, with Frank Ribery and Mario Gotze in support, is terrifying for opposition defenders. And having conceded only 13 goals in 29 Bundesliga matches, breaking them down is an uphill task that few have managed to overcome. 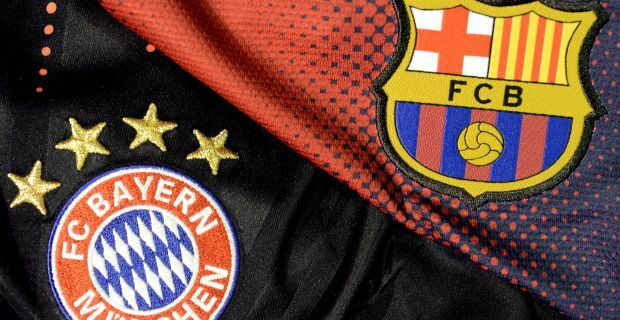 So as far as shocks in the latter stages of the Champions League go, the biggest upset of all would be if Barcelona and Bayern aren’t contesting the final in Berlin on June 6.